Originally farmland, East Portland’s Powellhurst-Gilbert is named for a pair of 1800s settlers, Jackson Powell and William M. Gilbert, whose names also appear on a trio of neighborhood elementary schools. As the city grew, residential development claimed much of the land, but pockets of flora and fauna as well as urban agriculture still exist within and nearby today’s Powellhurst-Gilbert. Consistently an area for new Portlanders, the population has transformed from the initial pioneer families to the present-day diversity where Asian, Hispanic and black citizens make up more than one-third of the area's residents, a characteristic that’s plainly reflected in the ethnically varied businesses. Powellhurst-Gilbert is home to a glut of markets that primarily cater to various Asian populations but are also popular with adventurous eaters and holistic health practitioners all over Portland. With the Fubonn Supermarket, Tin Seng Trading Company and Chang Fa next door to Tin Seng (which has been called a mini Fubonn), you can find a vast array of packaged goods and Chinese herbal medicines as well as a selection of fresh produce, meat and even live seafood. The substantial Fubonn (self-proclaimed "the largest Asian shopping center in Oregon") also provides shoppers with a proper mall experience where you can find bubble tea, a bakery, restaurants, a jewelry store, gift shop, bookstore, spa, salon, clothing stores and more inside the building. 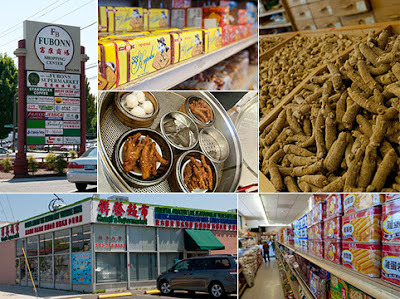 Focused on traditional Chinese medicine, the nearby Wing Ming Herbs offers additional herbs, spices, teas, ginseng and so on, while the Eastern European Roman Russian Food Store, features a deli and bakery with a much raved about honey cake and other pastries. Named in honor of statesman and community activist Ed Benedict, the almost 13-acre park that bears his name features the standard amenities (basketball, soccer, walking paths, picnic tables, playground) as well as an 18,000-square-foot skatepark with ledges, rails, stairs and banks. Artistically designed to feature Dan Garland’s multifaceted concrete art installation (“which provokes thought regarding the intersection between natural and man-made environments”) and constructed using recycled and sustainable materials, the skatepark features native landscaping and on-site stormwater treatment. 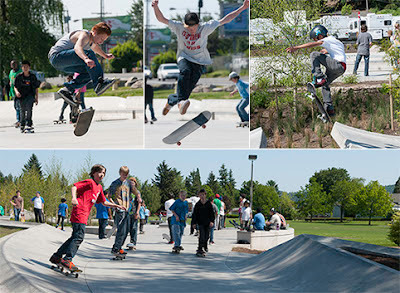 It’s even “considered to be the first environmentally sensitive skate plaza ever constructed,” according to Portland Parks and Recreation (PP&R). Find three more things to do in Powellhurst-Gilbert on Neighborhood Notes.